As we told you earlier, Mayor Darrell Bradley was a guest on OYE this morning. He’s been in the news a lot lately, primarily due to recurring litigation with sanitation company Belize Waste Control. But there is much more than that happening in Belize City. 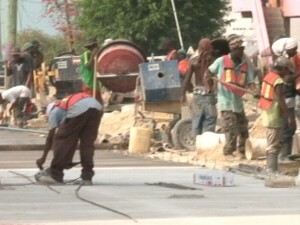 In 2013, there was unprecedented road-works in Belize City, along with unprecedented chaos, confusion and congestion. 2014 hasn’t been any different, as City Hall has embarked on a second, intensive stage of infrastructure works. This morning Bradley took the opportunity to provide an update on the ongoing streets and drains projects in the old capital. Bradley says that the Council continues to explore other infrastructure projects, including the construction of a park in Lake Independence.